Sauerkraut is something that I have so wanted to make for some time now. For those of you who do not know what sauerkraut is (as it is kind of unknown to most Filipinos, I suspect), sauerkraut is fermented cabbage that is more commonly eaten in cold countries, notably Germany. There are so many things to love about sauerkraut. It is cheap — only cabbage and salt. 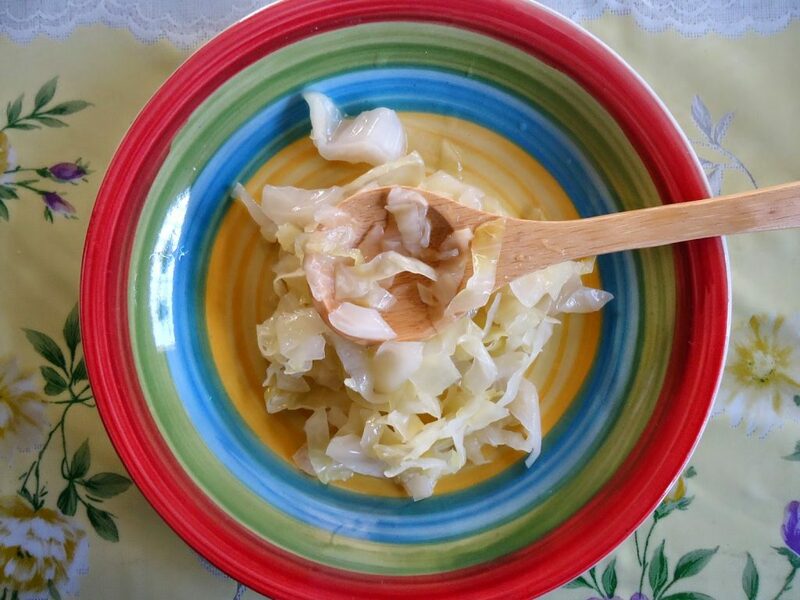 It is healthy — cabbage is simply fermented by good bacteria which in the process enhances the nutritional profile of the cabbage. It is raw food — not heat-processed at all. It is so easy — as you will soon see. 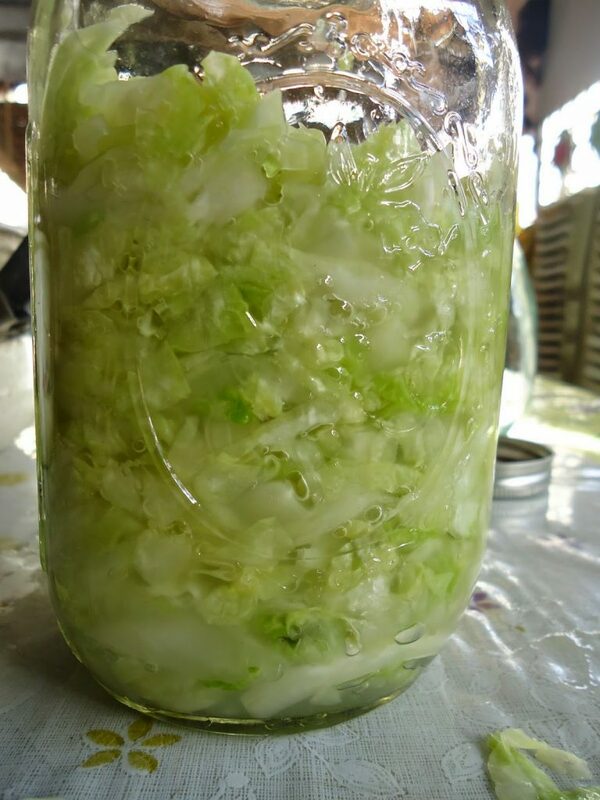 In the next posts I will be detailing the health benefits of sauerkraut and some lacto-fermented vegetable foods but for now I will simply be sharing with you my own experience on making my own sauerkraut at home — yes, in the tropical country of the Philippines. By the way, I got the recipe for this sauerkraut from a couple of sites and blogs — wellnessmama.com, theprairiehomestead.com and others — though it is dfordelicious.com, the blog of a Filipina expat in the US, which finally motivated me to make my own sauerkraut. 1. First off, pick the freshest, crispest cabbage you could find in town. That, and unrefined sea salt, are all that you need. Simple, eh? Remove the wilted outer leaves and then wash in running water. 2. 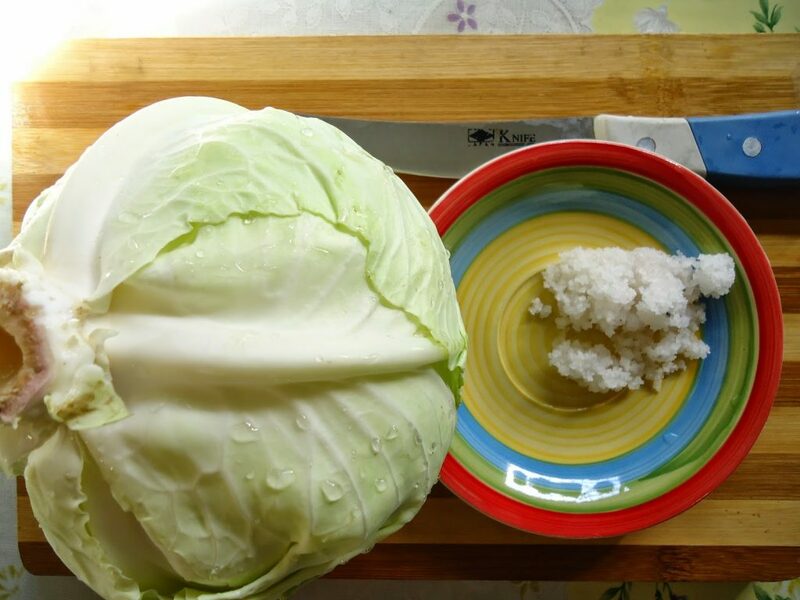 Next, slice the cabbage into thin 1-inch or so strips as the photo above shows. Put the cabbage into a big mixing bowl, preferably a non-reactive one such as glass. 3. Sprinkle with a tablespoon of unrefined sea salt. Dfordelicious.com recommends a teaspooon of toasted caraway seeds for flavor but I have not found the spice in retail in my city (just the gigantic jars) and so I made do without it. 4. 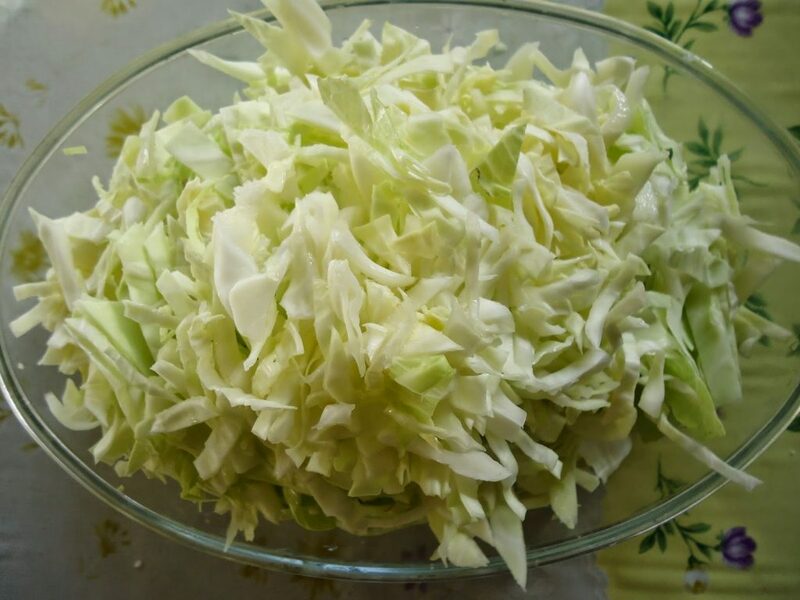 With your bare hands, crumple, crush and squeeze the cabbage strips, mixing as you go. Do not drain the juice. The cabbage strips will soon be reduced to about half of its original volume and their juices will ooze out considerably. The goal of squeezing is to coaxe out all the juices so as to have enough liquid with which to submerge the cabbage strips in. You may need to push down on the cabbage strips to keep them submerged in their juices. By the way, the fresher the cabbage, the more juicy it is, so make sure your cabbage is really fresh. 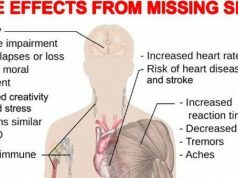 Make sure your mason jar is clean and dry.Make sure that that you’re not filling the jar completely. Leave about an inch from the top to allow for fermentation gases to vent. Lastly, do not close the lid tightly, just somewhat loosely. Fermentation needs some kind of anaerobic environment while at the same time allowing some fermenting gases to escape. 6. Leave the jar in a cool, dark place — yes, you heard read it right — unrefrigerated, for one week. Now it’s not exactly cold where I left it — around 25 to 26 degrees Celsius to be exact. Some foreign blogs say leave it for 3 weeks, but I suspect that this only applies to cold countries where their ambient temperature is cold enough as to lengthen the fermentation time. Here in the Philippines, I have found that 7 days is enough. Later though, I want to try to leave it longer to see how it goes. Every morning for 7 days, check on the jar for molds. I read that molds on top is not a cause to freak out. Simply remove the moldy layer with a non-reactive spoon (I used a wooden spoon) and get on with it. Scared? You bet I was, but I wanted it too bad to back out of it, with or without mold. I did find a few moldy strips on the third day which discouraged me a bit. However, I looked up my references again and all of them said to just skim away the mold or discolored ones and press down on the cabbage to submerge it — which I did. One more thing: do not be scared of the odor. Scary as it may seem, a funky, farty, pungent and sharp odor is normal. I tasted my sauerkraut on the 5th day but I did not find it tangy enough as my references said it should. I gave it two more days and then, when I taste-tested it — with much trepidation — I found it surprisingly tasty and pleasantly sour. It did seem strange at first but then it grew on me, though not yet on the kiddos. You can then transfer your jar of sauerkraut to cold storage in the ref, where it will keep for months as they say. I couldn’t personally vouch for that, though, as I used up my jar of sauerkraut in a week. 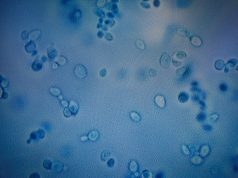 Cold storage will only arrest the fermentation but will not kill the good bacteria. As such, you can count on sauerkraut to be probiotic. Today, I find sauerkraut to be a much welcome side dish to my fried or grilled foods. Please try it. It’s easy, low-cost, tasty and brimming with good bacteria to keep bad bacteria away.